Zamaneh: Vahid Asghari, a jailed Iranian accused of “launching pornographic and anti-Islam websites”, has written two letters to the Iranian judiciary to file a complaint against Iran’s Revolutionary Guards Corps, accusing his jailers of subjecting him to physical and mental torture. HRANA, the Human Rights Activists News Agency, published the two letters today. Asghari writes that he has sustained “extreme spiritual, mental, familial, physical and bodily harm” from the “tortures” he was subjected to while in custody. Asghari was arrested in 2008 by the Ministry of Intelligence, along with Saeed Malekpour and Hassan Sisakhi, for their online activities. Asghari and Malekpour have been sentenced to death and Sisakhi is sentenced to life in prison. All three are currently being held in Evin Prison. Asghari writes in his letter that a simple exam by the coroner and a perusal of the Evin Prison medical examination will demonstrate beyond a doubt that he has been subjected to torture. He also indicates he has witnesses who would attest to the fact that he was tortured. 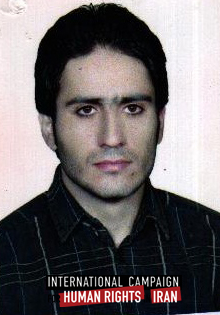 Asghari was arrested in May of 2008 at the Tehran airport as he was about to return to India to finish his studies. He was later shown on state television confessing to the charges laid against him. Asghari was sentenced to death in December of 2011. For 34 years the Messianic Islamist Rapists, “reformist” and all have nonchalantly violated the most basic human rights of Iranians and committed crimes against humanity. The only way to end this nightmare is regime change by Iranians for Iranians with logistical help from the sane world.